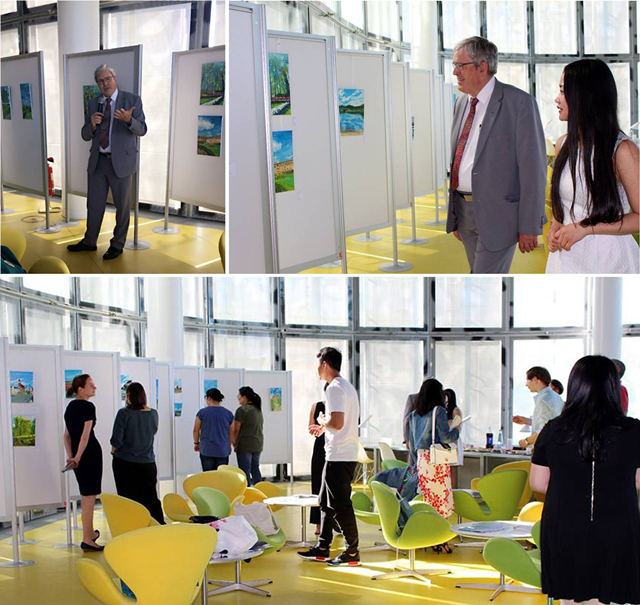 On June 1st , 2017, “The Footprint of Youth – Oil Painting Exhibition” by Wan Qin, an exchange student from School of Art and Design, Beijing Institute of Technology, opened in Brandenburg Technical University of Cottbus, Germany. Wan Qin, the second-year post graduate, went to Moscow University for academic study from March to May, 2016 and Brandenburg Technical University of Cottbus from March to September, 2017. This exhibition had more than 30 paintings, which were all painted by Wan Qin during her exchange period. At the opening ceremony of the exhibition, Jörg Steinbach, President of the Brandenburg Technical University of Cottbus, was invited to attend and delivered a speech. Frewer Sauvignz, Director of Library also attended the opening ceremony together with Dr. Börner, Director of Information Culture Center, Mareike Kunze, Director of the International Exchange Center, Dr. Müller, Director of the Press Liaison Department, Dr. Susann Harder, Professor Leo Schmidt, Tina Berge and other teachers and students.